Remove tops, membranes and seeds from peppers. In a medium bowl, stir together beans, pre-cooked rice, cheese, spinach and tomatoes. 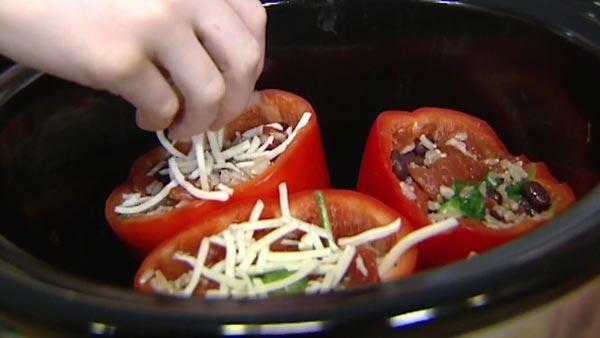 Pour broth in the bottom of the slow cooker and place peppers with the filled sides up in the cooker. You can top off with jack cheese as well. Cook for three to three and half hours on high in a slow cooker or 6 to six and half hours on low in a slow cooker.